My next summer destination was Edinburgh, Scotland. Mom and I arrived just in time to watch Scot Andy Murray win Wimbledon. It would have been cool if we had known a good place to go to watch the match with some locals, but one thing we learned this summer is that not too many UK pubs have TVs to watch sports. 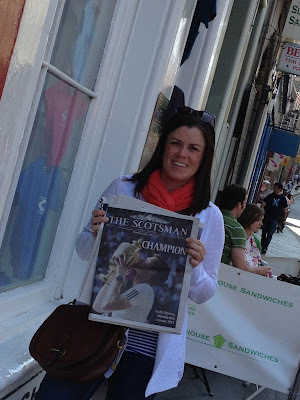 But we did buy the local paper the next day to see how the locals were celebrating the win! I rented an apartment right by Edinburgh Castle on the Royal Mile, so we were really conveniently located to much of the city's highlights. We went to the castle on our first morning and shopped the tourist traps along the mile. It's a shame that my immediate family lives in a really warm climate- I had to leave all the cashmere scarves behind! One of the last things we did on that first day was a whisky tasting. It was a little hokey, but they told us about the four different regions that make Scottish whisky and based on the notes you expect to find in that region's whisky, were able to choose which to sample. Unfortunately, I could barely drink the stuff! Does your affinity for it grow over time? However, the last room of the tour was filled with bottle upon bottle of whisky. It was really cool! Mom actually finished her sample of whisky. The next day we toured the H.M.S. Britannia, a ship used by Queen Elizabeth II and her family for more than 40 years. I'm relatively fascinated with British Royal history, so this was pretty cool. I especially liked being able to see rooms that Queen Elizabeth and Prince Philip had designed for themselves left intact from their days on the ship. One highlight of Edinburgh was a restaurant called Oink. It served some pretty amazing pulled pork sandwiches with stuffing (or haggis)- we went with the stuffing- and applesauce. Really good. If they had sold t-shirts I would've brought two home for Sheila and Janet- just look how fun their logo is! You should get lunch from here! And what trip to Scotland would be complete without a bagpipe player in a kilt.